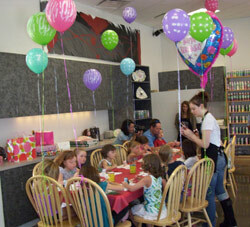 Painting pottery is a fun, relaxing and creative activity for people of all ages and artistic abilities. We have pottery items starting at only $12, and we never charge a studio fee. We have the largest selection of pottery pieces in the area and if that is not enough, we can look through catalogs to find the perfect piece for you. Never painted pottery before? No problem! We have tricks and tools to turn anyone (and any age!) into a brilliant artist. Remember, no reservations needed — just come on in! Pick your piece of unfinished pottery (called bisque)…we have hundreds of items to choose from! Pick your paint colors and unleash your creativity! Don’t worry, we have a ton of samples to inspire you along with books, tricks and tools. When you are done, leave your masterpiece with us and we will glaze (the shiny stuff) and fire it for you in one of our three kilns on premises. Come back to the studio in about a week to retrieve your personalize piece of art! Great parties at Arts on Fire! Experts – our staff can help you get that effect you are looking for or can suggest colors and show you secrets (shhh!) on how to get GREAT results! We have four kilns on site to ensure quick turn-around time! And if you need inspiration before you come in, check out our photos page for current ideas, holidays ideas, glass pieces, and much more! Have more questions? Call us at 303 470-0530 or email us!